The new Motorola Moto 360, the second generation of the original circular Android Wear smartwatch, has just gone official and wasting no time, it has appeared up for pre-order on the official Motorola website along with one of Motorola's top smartphones this year - the Moto X Pure Edition. 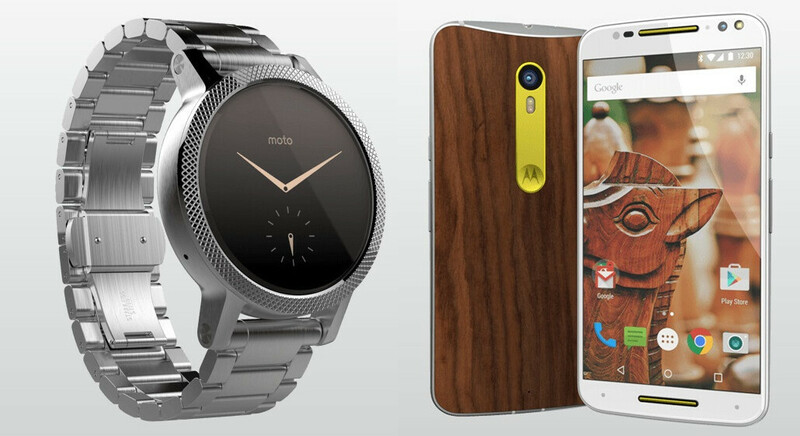 The two devices both support Moto Maker with its plentiful customization options. When it comes to the Moto 360, you can customize the style and size, the color and style of the bezel, the band and choose the watchface it will ship with. The Moto X Pure Edition, on the other hand, is offered in a 16GB version, a 32GB one (+$50), and a $64GB model (another $50 on top of the 32 gig). You can customize its frame and front, and you have the awesome wide choice of back covers: from various colors and styles for the plastic ones, to different leather versions (+$25) and various wooden ones (also, a $25 premium over the default plastic). Then, you can customize the color of the accent around the rear camera, you can have some custom engravings, as well as a greeting to see when the phone fires up. Moto360 site is down, must be getting slammed. Or poor site structure. Motorola let's not dupe this release. The leather version I built costs more than the metal version I bought last year. Though the contrast of the bezel, body, and straps makes for some sharp looking options.